Wild Viking is a card game that is very similar to Roulette. It is offered by top leading gaming provider Playtech and is available at most online casinos that utilize this software. Instead of using the Roulette wheel there are cards instead that are drawn by the dealer and shuffled from a 52 card deck. Two jokers are included in the game play. 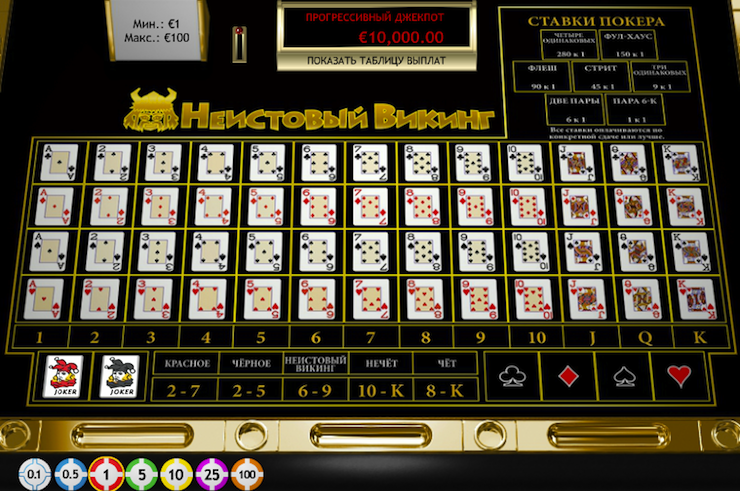 The gameplay is similar to roulette – you have the option to make multiple bets. To place bets, select the chip value and left-click on the area on which you wish to bet. Right-click to reduce or remove a bet. Note that while right-clicking the bet, the amount removed is equal to the chip value currently selected. You can remove all bets by clicking the Clear Bets button. The last card drawn determines the outcome of all Roulette Bets. If the last card is a Joker, all bets lose except for the Wild Viking Bet, the Poker Bets and the Progressive Bet. All five cards combined determine the outcome of the Poker Bets and the Progressive Bet. The first and the last card drawn determine the outcome of the Wild Viking Bet.